Through these stories, we learn how people dealt with similar or more severe challenges that we face, and what the outcome was for them when they had Allah on their side. 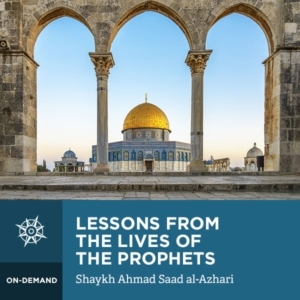 Join Shaykh Ahmad Saad al-Azhari as he beautifully explores some of the stories of their Qurʾan and their timeless lessons. In this captivating series of lectures, Shaykh Ahmad Saad explores the purpose and delivery of the suras of the Qurʾan to unlock their aim: to direct us towards of Allah Almighty and the Day of Judgement. Among them is the story of the prophet Musa, which is discussed here at length. Musa’s story gives many insights into a wide array of matters, such as the tactics of “divide and conquer” used by Firʿawn to subjugate the Israelites. We follow his career from before prophethood and beyond – learning many lessons from the mistakes of his followers. Other stories covered here are of Dawud and Sulayman, who were avid in remembering Allah despite being given vast wealth and power. We also look at Maryam and her son ʿIsa, who was a product of a righteous mother, and the story of the prophet Yunus, who was rescued from difficulties due to his devotion and glorification of Allah. Such stories provide us with real examples of people who were tested in various ways, and the lessons we should take away for our lives when we are tested in the same way, even if it not to the same degree.